The store is readily Instagrammable, right down to the circular tent in the middle and the suit owned and worn by Kendrick Lamar. It’s also scented with a fragrance specifically designed for The North Face, intended to remind certain customers of California’s Yosemite National Park. — Read more at The North Face Opens a (Custom-Scented) Williamsburg Prototype Store at Bedford + Bowery. — Cartier's pop-up installation for Carat can be found at the Cartier pop-up shop on Wooster Street in NYC, or at rue Vieille du Temple in Paris. Read more in At Its ‘Rendez-Vous’ Experience, Cartier Mines the Past and Present to Reinvent Classic Luxury at ArtNet. The vials on the display rack bear curious labels like Rose Otto and Osmanthus Absolute. If you ask about them, you are likely to get some fascinating back story. The lavender, for instance, which boasts 1,200 natural compounds, is harvested in the Alps by delinquent French teenagers from Nice who are sent to the floral farm for emotional healing. — The New York Times checks out Manhattan boutique Enfleurage, which specializes in aromatic materials. Read more at The Sweet Smell of Osmanthus Absolute (and see Alyssa's interview with the owner, part 1 and part 2, or Jessica's review of a few of their finished fragrance blends). How about a trip to Soho to visit the pop-up St. Ives Mixing Bar? "The first-of-its-kind, this 1800-square-foot store is inspired by the joyful, vibrant energy of nature and St. Ives' key ingredients. It features a mixing bar where guests can choose from more than 50 unique ingredient combinations and desired body lotion richness or facial scrub exfoliation levels. 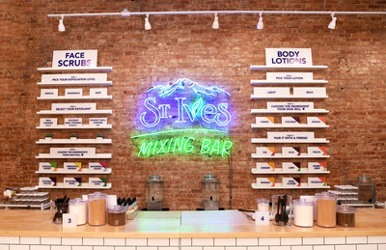 In addition to showcasing many of the St. Ives ingredients people know and love, the St. Ives Mixing Bar will also offer guests the chance to experience over 20 new, on-trend skincare ingredients such as pink lychee, kale, ginger and volcanic sand. All custom face scrubs and body lotions will retail for $12 each." It's open Monday through Saturday from 11-9 and Sunday from 11-8, through July 30 at 577 Broadway (at the corner of Prince). More information at St. Ives Mixing Bar. With a list of the women’s sweaty top notes in hand, Yi then worked with a Parisian perfumer to recreate a synthetic interpretation of the armpit aroma and spiked the concoction with smelly chemicals emitted by carpenter ants. — Anicka Yi’s exhibition “Life Is Cheap” is open at the Guggenheim through July 5. Read more at Olfactory science meets contemporary art, plus ants at Chemical & Engineering News, or see Please Smell the Art: Anicka Yi Will See That You Do at The New York Times, or Artist Anicka Yi’s Scents and Sensibilities at Vogue.